Welcome to Panoply, where the theme for today's tablescape is Morning Glory, "Bee"ing Served Alfresco! Like many of you in the Northern hemisphere, we are experiencing the hottest of summer days here (welcoming the respite of some occasional rain! 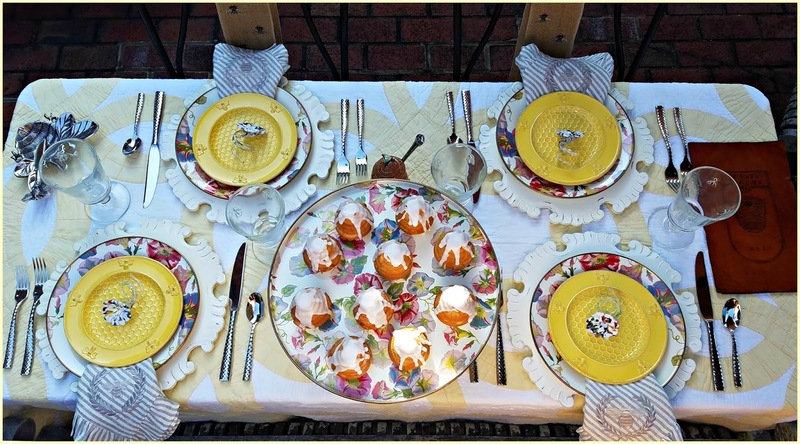 ), so the key for alfresco dining is to "bee" versatile. 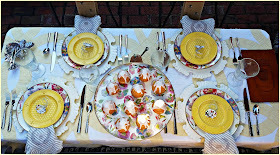 I'll explain as I share today's tablescape, which is centered around morning glories and their bee pollinators. As the vintage leather menu and honey pot above suggest, let's picture ourselves at the Beehive Tavern for a little morning brunch, perhaps starting with any number of recipes found here*, made with honey or bee pollen products. (*Note: I have not made any of the recipes, nor can I endorse or deny the benefits claimed). 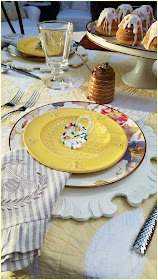 Our place settings start with a set of Morning Glory enameled plates, placed atop my very versatile ivory chargers. 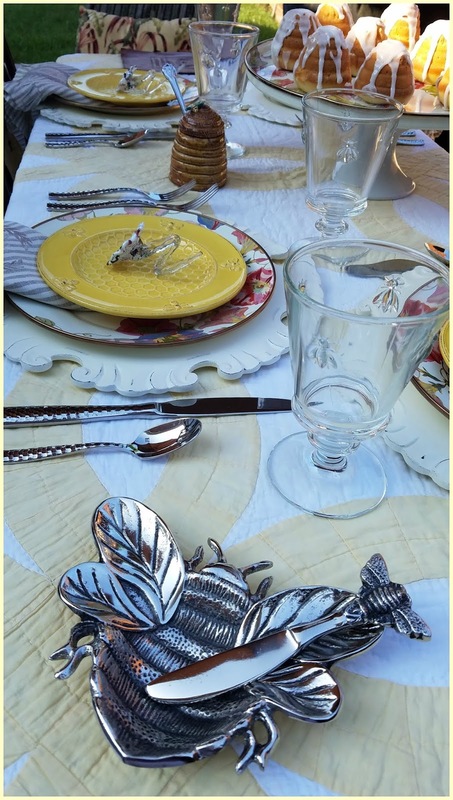 The flatware pattern mimics a honeycomb with its checked pattern. While I don't have any morning glories planted in my own garden, I do find the occasional wild morning glory vine attempting to establish itself, tangling in and among the branches of other shrubs or perennials. While the vines can be invasive, when intentionally planted and controlled, they send beautiful blooms and are great pollinators. 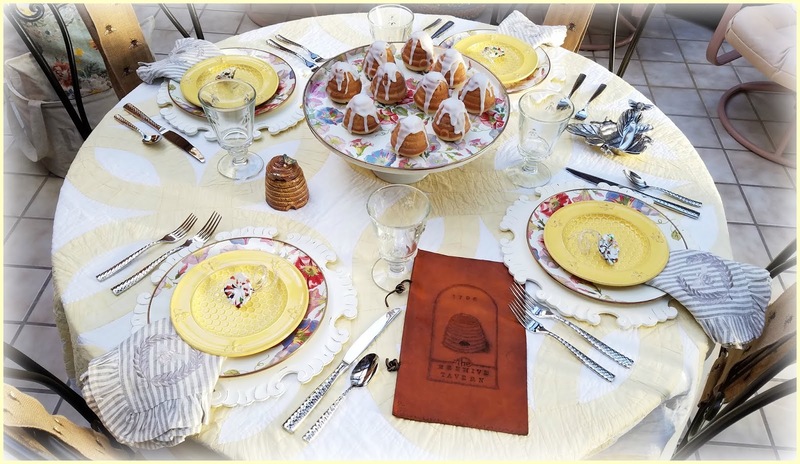 French stemware with bee motifs, and salad plates with bee and honeycomb design are complementary to the theme, as are the French bee linen napkins. 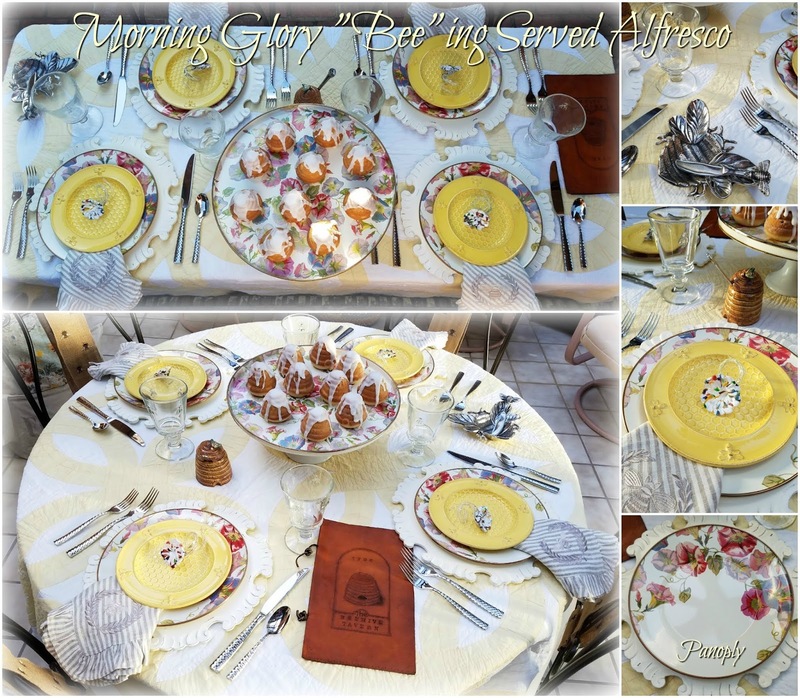 A single morning glory bloom in hand-blown glass sits atop the salad plates. 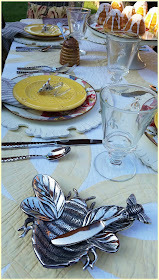 These are actually napkin rings, doing double duty as place cards for guests. 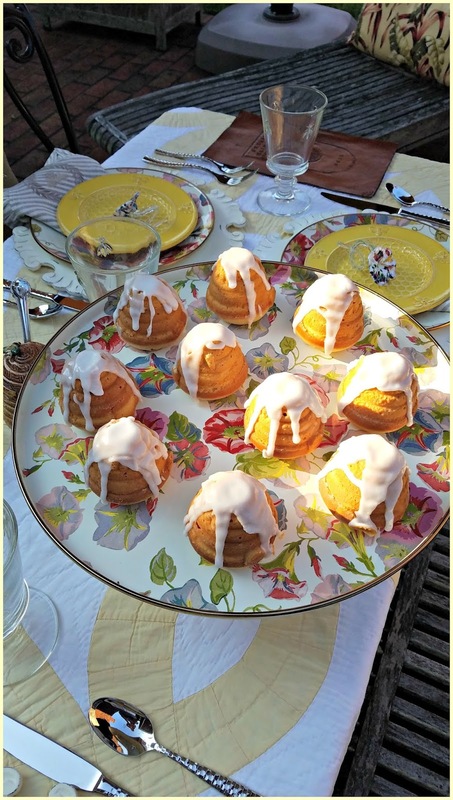 Mini beehive, honey lemon cakelets** were prepared and served on a Morning Glory round tray. 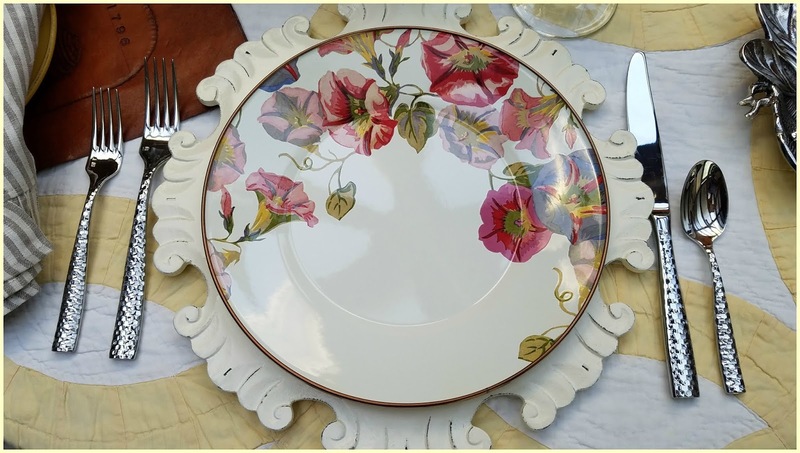 The tray was perched on an ironstone pedestal for table serving at a level above the plate service. 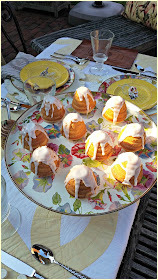 (**I did make this recipe and liked it well enough to repeat, especially since Mr. P. liked the cakelets. They freeze well also). A metal dip dish set in a bee motif can serve up any number of small sides, from jams to cream cheese spreads or flavored butter. 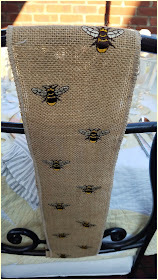 The metal backs of the cushioned chairs are embellished with wired burlap ribbon, embroidered with bee motif. They're simply cut to fit, and bent into a tucked fold along the length of the chair back. Opposite the chairs, a teak wood bench was used, with comfortable throw pillows for leaning into. A vintage quilt is used as the table covering. 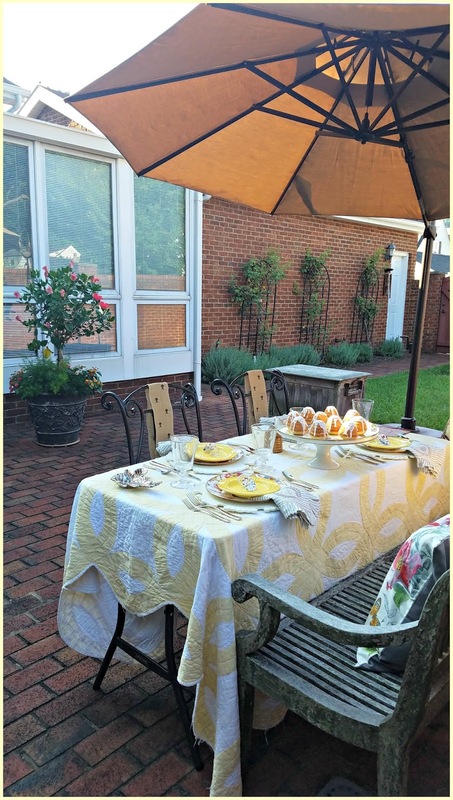 Its pale yellow color and frayed edges show signs of timewashing and wear, a perfectly imperfect addition to the outdoor setting. 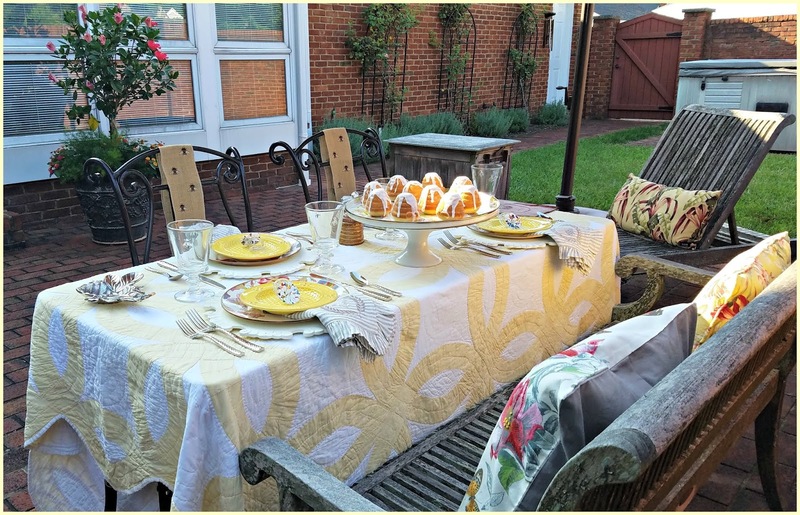 A chaise recliner sits at an angle near the table setting, while a large, cantilever umbrella shades guests from the sun. 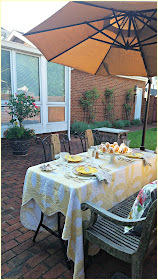 The morning I prepared this brunch setting outside - around 8:30 am - the heat and humidity were already extreme. No worries! Looking at the photo above, you can see one side of my sunroom windows, and French doors are just left of the hibiscus container planting. 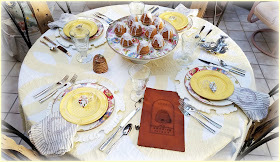 Just swing open the doors, turn on air conditioning, or opt for the fan and open the windows, and we have ourselves a modified alfresco table setting, where it's much cooler. 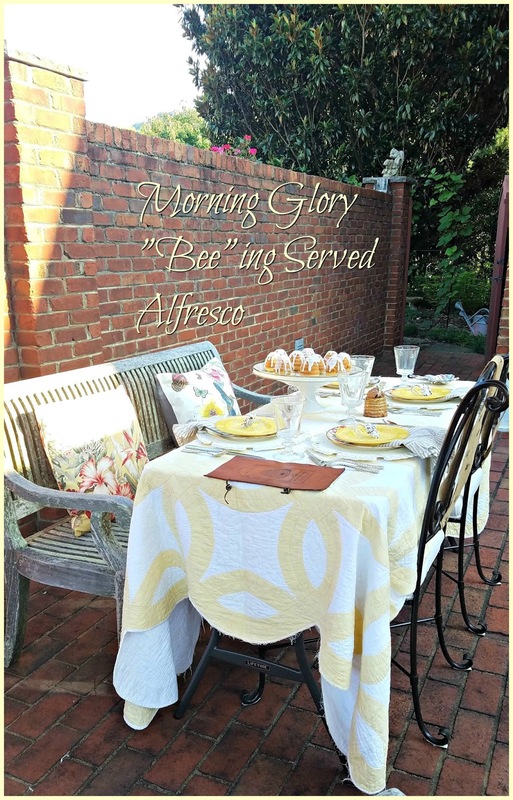 And that, my friends, is what I mean when I say the key to alfresco dining is to "bee" versatile! You never know what your weather may bring, so always try to have a Plan B in mind. Now, would you like to have a seat indoors or out? Please, either way, "bee" my guest! Joining with several others this week, we are each presenting our ideas for alfresco dining. You'll find the rest of the participants' links conveniently located below. A special thanks to Chloe of Celebrate and Decorate for organizing us and keeping us inspired! 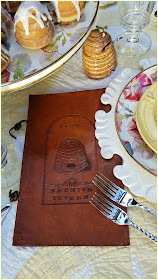 I think you'll certainly "bee" inspired by visiting my friends at each and all of the links. As always, thank you for visiting today. 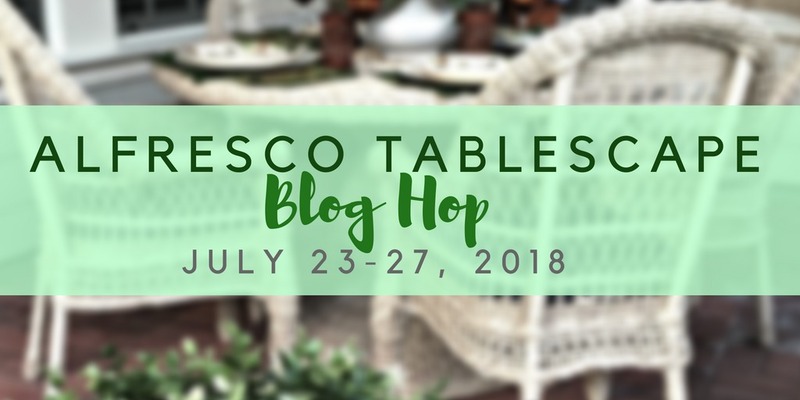 If you're new to my blog, I'd love for you to join in the conversation with a comment so I'll know you were here! Regardless, I hope you leave feeling a little more inspired.